You can get Professional Oven Cleaning from just £49 or book End of Tenancy and have your oven cleaned included in the price! Oven cleaning can be atedious and boring job. If you wish to return the sparkle to your kitchen, but don't have the time or will to do it alone, let us help you. Our cleaning materials are greatly distinctive and are able to provide perfect results every time. Non-toxic, non-caustic mixes will help preserve both your health and the environment. And the oven will live longer, too! Rest assured, that when you decide to call us, we will be at your doorstep shortly. 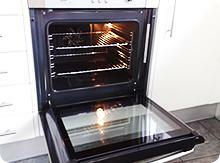 London oven cleaning using environmentally-friendly cleaning processes takes the burden off of you. You can enjoy a clean oven, a sparkling kitchen, and, once the work is finished, a nice home cooked meal without lifting a finger. As we strive to bring you, our customer, supreme satisfaction with our London oven cleaning service, we not only use our amazing eco-friendly cleaning solutions, but we give it our best to do finish the job in a timely and effective way. You can be assured, that we always aim for the perfect results and will not rest until they are achieved. After all, you deserve the best, don't you? If you are in need of more information on when and how we can come, feel free to ask our friendly associates on 020 3404 5155.They will be there to help 24/7, as we work throughout the whole week. 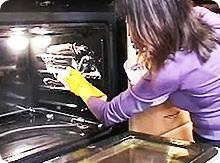 If you don't wish to call, you can Book Online Your Oven Cleaning Now. It can be used the same way and is quite easy to fill in! Just take a look and agree with our Terms and conditions, before you book an appointment.